A playful spirit passes away. Let the participants create the case. Playing hit and run with social issues. What buttons do you choose? Public workshops in the USA. 27 videos to learn from. Reprinted from THIAGI GAMELETTER. Copyright © 2011 by The Thiagi Group, Inc.
One of our wonderful friends, Mike Doctoroff, founder and chairman of Trainers Warehouse, passed away December 1, 2010 after a long battle with ALS. Mike was a genial, creative, and playful person. He invented, produced, collected, and distributed several tools for trainers that made their sessions more engaging and enjoyable. He founded and developed a retail distribution organization that has become the single source for all types of effective training resources. I had the pleasure of talking with Mike about his ideas and plans. Our condolences to Mike's wife Honey, his daughter Sue, and the rest of his family. I have no doubt that they will carry on Mike's tradition and core values and continue to fulfill his mission. Let's compare the training of adults in two different cultures. For the present, let's call them Culture A and Culture B. Later, you can figure out where these two cultures are located. In Culture A, the trainer is responsible for making learning happen because participants don't have sufficient knowledge or experience to decide what they should learn. After all, adult participants are children with big bodies. Good participants are eager to listen, take notes, and accept everything the trainer says. They do not disturb other participants (and the trainer) by asking silly questions. They wait patiently, because the trainer will explain everything to them at the appropriate time. Effective trainers are experts in their subject area. They focus on what is good for most participants without wasting time and effort to accommodate the slower or smarter ones. In Culture B, participants assume total responsibility for their own learning. They take a major role in determining what they should learn and how they should learn it. The facilitator guides the participants' learning process by providing access to different sources of expert content. Effective facilitators are experts in structuring the learning process, making it interactive, and encouraging participants to learn collaboratively. In Culture A, the trainer derives the instructional objectives by analyzing the content area, using his or her expert knowledge. The trainer also decides what, when, and how the content should be presented to the participants. Generally, the trainer uses a deductive approach by explaining the rules and principles first and then describing specific applications in a logical order. The trainer sticks to facts and expert opinions because there is no room in a lesson for emotions and feelings. Effective trainers do not deviate from their lesson plans even in the face of tangential questions from participants. It may be true that some learners have different experiences, entry points, and personal agendas. But these differences are irrelevant because the trainer knows what everyone needs to learn. In Culture B, the facilitator works with a few typical participants to outline the session in terms of appropriate, participant-centered activities. The training goals are selected to meet the needs of participants. The activities are sequenced to facilitate the processing of content and discovery of principles. The original outline is modified by the facilitator (and sometimes totally abandoned) in response to participant's questions and reactions. In Culture A, the trainer takes on the role of a sage on the stage and presents the content through explanations and demonstrations, using a chalkboard or a flip chart. Participants take notes and supplement the lectures by reading assigned sections in their textbook. In Culture B, the facilitator takes on the role of a guide by the side and conducts a variety of learning activities that incorporate hands-on experience and invite interaction among participants. The facilitator may use reading assignments and lecture presentations, but they are always followed by interactive exercises that encourage participants to explore, evaluate, analyze, synthesize, and apply the content to their workplace context. In Culture A, the classroom is formally organized to focus on the trainer and to make it easy for the participants to listen to the lecture and to observe the demonstration. The classroom is also designed to prevent distractions from other participants and from the outside world. The furniture requires participants to sit up straight and to take notes. In Culture B, the training room is informally arranged to facilitate interaction among participants. The furniture typically consists of round tables with chairs around them. However, participants are frequently on their feet, roaming around the room and interacting with each other. The walls of the training room are plastered with posters, many of which are created by the participants themselves. In Culture A, participants take a final written test that measures their ability to recall the content from the lectures and textbooks. The trainer scores participant responses and awards grades, making sure that participants are spread along a bell-shaped curve. Test scores are used to determine who should be certified and who should fail. In Culture B, numerous participant activities enable them to constantly check their mastery of the training objectives and their ability to apply them to different situations. Participants receive immediate and specific feedback from their peers and from the facilitator. This type of performance-based feedback improves individual performance and the overall effectiveness of the training activities. Later this year, Tracy and I will be facilitating a summer institute on interactive strategies for multicultural communication. Eleven summers ago, when I first offered this institute, participants had no difficulty identifying Culture B as U.S.-American (along with Canada, England, Australia, Holland, Denmark, and Sweden) and Culture A as the rest of the world, which includes 85 percent of the population. These participants also considered it elitist and colonial for U.S. trainers to impose their Culture B training approaches to Culture A countries. Last year, in Zurich and Singapore and Paris, participants from 12 different countries found that the training scene is no longer black and white. Some reported the increasing use of interactive, experiential strategies in European and Asian countries that traditionally belonged to Culture A. At the same time, others reported increasing demands for passive procedures among Culture B countries, especially in technical training areas. In addition, most participants found it difficult to identify exclusive application of training techniques associated with either culture. The new group of trainers seems to favor their own blended combinations. The times are changing—along with cultural perspectives and preferences related to teaching and learning. There is no single best method. As a flexible facilitator, it is important for us to have available a wide variety of training strategies so that we can pick and choose the best combination that fits the cultural context, participant preferences, and content requirements. To identify the steps in the basic needs analysis process and to apply them to a simulated project. Any number can play. This activity works best with 12 to 30 participants. Copies of Needs Analysis , a handout that explains the need analysis process. Copies of How We Figured Out How To Double Our Monthly Income , a case that illustrates specific application of the process. Master the model. Your success in using this activity format will depend on your fluency with the basic needs analysis model. Carefully study the handout that explains the process. Figure out what is happening in each step and how the steps are linked to each other. Create a story. The best way to master the model is to make up a fictional case that illustrates the application of the needs analysis process. This is what you will be asking the participants to do, and you need a sample story to prime them. Review the case study to figure out the plot line for your story. You can base your story on one of your own successful projects. If you do so, don't let facts get in the way of a good story that clearly tracks your progress through the needs analysis steps. If you are adventurous, create a story around some popular TV show. If you are fainthearted, plagiarize the case from the handout. Needs analysis is the essential first step in applying human performance technology to solve performance problems. It is also the first step in the instructional design process. By applying this systematic process, you avoid solving a wrong problem or a trivial problem. You also avoid solving the right problem with a wrong technique. Needs analysis involves clearly defining a performance problem as a gap between what you want to happen and what is actually happening, finding reasons for this gap, and closing them with an appropriate intervention. Distribute the handout that explains the needs analysis process. Point out that the handout identifies the steps in the process and the relationships among them. Ask the participants to read and review the handout. Announce a 3-minute time limit for this activity. Tell your story. At the end of the time limit, announce that you are going to tell a story of the needs analysis process in action to make the abstract model become concrete. Narrate your story, pausing at the end of each “chapter” to refer to the steps in the process. Distribute the case. Explain that this case study illustrates the application of the needs analysis process. Suggest that the participants refer to this case study later—after you give them an assignment. Assign the story-creation task. Divide the participants into teams of three to five members each. It does not matter if some teams have an extra member. Ask each team to begin creating a fictional case study of a successful application of the needs analysis process. The first chapter of the story should clearly illustrate the application of the first step ( Identify the ideal performance ). The teams have 3 minutes to create the first chapter. Invite a team to present its first chapter. Give the teams a 1-minute warning. Ask the teams to give finishing touches to the chapter. After another minute, randomly choose a team to send its storyteller to the front of the room. Ask this person to present the first chapter. Add the second chapter. At the conclusion of the presentation, ask all teams to continue the story they heard by writing the second chapter. Apologize to the members of the other teams. Explain that you are going to ignore the first chapter they had created earlier. Make sure that the teams understand that they are to create the second chapter to continue the first chapter they heard. Explain at the end of the 3-minute time limit, you will randomly select a team (that could even be the team that read its first chapter) and hear the second chapter. Continue the story writing activity, one chapter at a time. After 3 minutes, select another team and have them read the second chapter. Ask the teams to create the third chapter to continue the ongoing case study. Repeat this process with all teams writing the ensuing chapters and the chapter from one random team being added to the continuing case study. Conclude with a caveat. At the end of the sixth chapter, congratulate the teams on their depth of understanding of the needs analysis process. However, point out the inherent danger in using a mechanical, step-by-step process. Warn the participants against rigid, obsessive use of the needs analysis steps. Needs analysis is the process of identifying a suitable solution to a performance problem. You do this by specifying the problem as a gap between the ideal state and actual state, discovering the causes of this gap, and selecting a suitable intervention to remove (or reduce) these causes. Interview the client and other stakeholders (such as the members of the work team, managers, and customers) to specify the desired performance of typical employees that will produce the results they would like to see. This level of performance is known as performance to standard or the ideal performance. Interview the client and other stakeholders to specify the current level of performance of typical employees. Validate this actual performance level by observing the employees, conducting surveys, and analyzing existing records. Use the information collected in the earlier steps to define the performance problem as the difference between the ideal and the actual state. Whenever possible, convert both the ideal state and the actual state to the same units of measurement, and define the gap in specific quantitative terms. Continue with additional interviews and other data collection strategies to discover the probable causes for the gap between the ideal and actual states. Analyze the probable causes identified in the previous step and organize them into suitable categories (such as lack of skills, lack of motivation, or lack of tools). Through additional analysis and interviews with different stakeholders, narrow the causes to one (or two) root cause that, if removed, will narrow the performance gap. Review the performance gap and its root cause. Select a suitable intervention: a strategy that removes or reduces the gap by removing the root cause. I am the CEO of a small company with four employees and a couple of freelance associates. Among the other job responsibilities that I have, I act as a performance technologist in my company. This was a silly question because we were having difficulties even in meeting our current payroll. After laughing at this question, we decided to take it seriously and use it as a trigger for conducting a needs analysis. Give everyone a 20 percent pay raise. Make more money every month. Get a bank loan and pay people more money every month. This amount should enable us to give everyone a 10 percent pay raise and meet our monthly payroll without any difficulty. We knew that we had difficulty making our monthly payroll frequently. But we did not have any idea on how much money we were making each month. Different people came up with different estimates and they varied significantly. Even our bookkeeper was clueless about our monthly income. When confronted, he mumbled something about wide variances in our earnings and the differences among accruals, receivables, cash flow, and so on. We asked him to get some solid data and report to us during the next meeting. We threatened to fire him if he did not have accurate and up-to-date data. At the next meeting, our bookkeeper did bring some credible data in the form of a spreadsheet. The bad news was clear for all of us to see: We made an average of $23,487 during the past 8 months. The predicted income for the next 4 months did not appear to be significantly different. There were a lot of wild speculations, and some of them had nothing to do with the performance gap. Some people are paid bloated salaries. The government is moving toward socialism. Most clients want eLearning. We don't have a credible track record in that area. We are not listening to our customers. We don't have the bells and whistles that the other consultants flaunt. We need a marketing person. Eighty percent of our income comes from two major clients. We are not charging enough. Look at Tom Peters. He charges $20,000 for each keynote speech he delivers. We should develop and sell products. We have reached our capacity in providing consultation and conducting instructor-led workshops. We are not marketing our products and services. After talking about the cause behind the root cause, we figured out that we lack sufficient capacity to handle the demands of marketing. So our intervention was to hire a hot-shot marketer. Gauthier de Pierpont has been working in business theatre for more than 15 years as a scriptwriter and improv actor. One day, when asked to a training workshop in public speaking, he borrowed principles and procedures from his background to create a highly interactive design, based on improv exercises. This got him started off as a trainer. Very soon, his toolkit expanded to include eclosive pedagogy from Andre Coenraets in Belgium ( http://www.cefar.org/ ) and framegames from Thiagi. Eclosive pedagogy is based on the idea that the knowledge is within the participant and that the facilitator has to create the proper structure to let it emerge! Gauthier's playful and creative mind combined it with the Thiagi philosophy. Creating, developing, and facilitating games became the most engaging part in his training business. Now for more than 10 years, he's been designing made-to-measure programs on interpersonal skills. Games he's designed include Chinese Torture Jolt , Hurdle of Gratitude , Ten Commandments Team Game , Emotional Hundred , Psychic Debrief . These games are not yet well known, since his book is still to be published. Currently, he conducts workshops in Belgium and has launched a new project, Whats-Up? , an event company specializing in tree climbing and teambuilding events. TGL: Gauthier, what is your specialty area? Gauthier: My favorite areas are communication, interpersonal relations, and team dynamics. I love jolts that make people experience a direct emotion and require them to handle their relationships. I'm always amazed by the fact that we, the human beings, have been taking interpersonal communication for granted. Gauthier: Having no specific background as a trainer and my being too lazy to prepare slides and write handouts led me to taking short cuts. Discovering the concept of framegames in 2003 gave me the necessary tools to design interactive training. TGL: How do your clients respond to the use of games in training? Gauthier: They welcome the idea, but still hold on to the belief that you need an expert with a lot of content. The correct-answer syndrome is still very strong in Belgium. However, once the clients experience training games, they love it. TGL: How do your participants respond to games? TGL: What was the most horrible or embarrassing moment you had in conducting games? Gauthier: Honestly, I don't know; I must have a very selective memory that only reminds me of the good things. Gauthier: Believe in it, have faith, or don't do it! Trust the collective intelligence of your participants. If you cannot, don't do it. Playing is a demanding art: as a facilitator, your instructions have to be very clear. One word can change the activity and the outcomes. Remember, playing is a serious business! Really! If you do training for the purpose of being on stage, and if you are sure that you know what is best for the participants, then go for politics. You'll have a much more successful career than in training. TGL: What types of games do you use most frequently? Gauthier: Physical games, team challenge games, roleplays, simulations, and improv games. Having recently completed Thiagi and Tracy's training in Paris, my practice is expanding. TGL: What is your most favorite game? Gauthier: Big Foot Small Foot is one of the best games for me. Participants pair up and stand facing each other with the distance of about a meter between them. The person with the smaller feet closes her hand and makes a fist. I tell the “Big Foot” to open the fist within 20 seconds. Participants' reactions are great: Most of them try to force the other person's fist to open. Others bite, offer money, tickle, or threaten. Everyone ignores the technique of making a simple request: “Would you please open your fist?” This game is always followed by a great debrief. The second one (I know you asked for only one) is the Inspired Manager , based on the guide and the blind person. The aim of the game is for the guide to help a blind person navigate a route. The guide has to use voice directions alone; the players cannot touch each other. This basic game is already engaging. But I add a second part with slightly different rules: One person sees, four others are blind. The guide cannot touch her team. Team members cannot touch anyone else. They have to navigate a twisting route. Usually, when the guide gives instructions, the four people walk in different directions. This is a great activity to debrief about the ability of a manager to lead a team. TGL: Who are your favorite game designers? Gauthier: Thiagi—but he needs to write things in French. Gauthier: Thomas d'Ansembourg : Qui fuis-je? Où cours-tu? À quoi servons-nous? Vers l'interiorité citoyenne . It's not a book about games, but it's a book about why is it worth playing games and training people. Gauthier: In Belgium, games are going to pop up and become popular in 5 years. It's urgently needed in this high-pressure business world. And my future is there. That's where I want to be: playing, having fun all day long, and getting paid for it! What else could I ask? This activity provides a playful way for participants to find commonalities among themselves. Ask participants to form a circle with one person in the middle. If the other participants can answer the question positively they must cross the circle and find an open spot on the other side left by someone else who also answered the question positively. The participant in the middle also finds a spot left open by some one who answered the question positively. A new person is left in the middle. This person gets to pick a new topic. The game continues as time allows. Reprinted from the November 2010 issue of Firefly News Flash by permission of the author. Bumper stickers are a popular medium for sharing ideas: free speech, self expression. People state their passions and reveal bits of their personality, politics, and sense of humor. Whether clever, contemplative, or caustic they invite tailgating for curiosity's sake. But I can't help wondering. What does a yellow ribbon mean for her, exactly? What does a peace symbol signify for him? The catchy phrases accelerate and disappear before one can formulate a follow up question. Like a TV commercial or a politician's sound bite, bumper stickers allow us to play hit and run with important social issues. Bumper stickers, sound bites, Facebook, Twitter, 99-Word Stories. Examples of the quick opinion abound! And while quick is clever and may even get the message across, it's the chance for a follow up question that leads to an interesting encounter. We probably let too many chances for a meaningful conversation “drive by.” And there are probably good reasons: being busy; wanting to avoid controversy; not noticing an opportunity; or even reluctance to change our own opinion. But being able to engage in a substantive conversation helps strengthen relationships which can lead to solid friendships, better teamwork, increased productivity, and expanded creativity to name just a few outcomes. That's why I like this collection of pins with quirky quips and eyebrow-raising comments. Distribute them to participants in a training, meeting, or party. Then invite people to use them to spark essential conversations with others in the room. Each button is large enough to attract attention but small enough that you need to be close to read it. Close enough, too, to have a conversation! Help! I think I'm a rock star. I'm one epiphany short of a paradigm shift. Please don't make me go to my dark side. …you can promote important moments of sharing with a touch of humor. 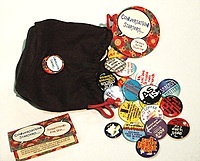 With fifty buttons in a convenient cloth bag, Conversation Starters can be easily carried to any event. Suggestions are included for using the set to break the ice, make introductions, process an activity, or plan for future action steps. Conversation Starters are available from Experiential Tools ( http://www.experientialtools.com/ ). Learn more about both in the following interview with their creator, Jennifer Stanchfield. Jen Stanchfield is known for her work in helping schools and organizations use experiential methods to promote learning and community building. She is the creator of Conversation Starters , and author of Tips and Tools: The Art of Experiential Group Facilitation . Firefly News Flash: How would you describe yourself and your work? Jennifer Stanchfield: I have a passion for helping people learn from interacting with others, solving problems, experimenting, and engaging in individual and group reflection. I work with counselors, teachers, youth-workers, coaches, and trainers, anyone trying to create change and growth in people or groups. An underlying philosophy of my work is the theory of experiential education and the idea of being a “participant-centered” teacher or facilitator. FNF: How did you become interested in experiential education? JS: As a child my family moved around a lot and I experienced many different schools. My first few years of school I attended two different Montessori programs. These experiences were in great contrast with my more "traditional" public school classroom experiences throughout the rest of my schooling. In High School I took part in an adventure program that was life changing for me. This empowering experience emphasized the difference between my "traditional" educational experiences in formal classroom settings and field experiences. Through this program I gained a sense of self-reliance and confidence, and learned communication and problem-solving skills. I began my college career studying special education. Then I discovered recreational therapy and the idea of using activities to teach and help people explore and work through problems and practice coping skills. I ended up with a dual major in recreational therapy and outdoor education and was first introduced to the philosophy of experiential education and the work of John Dewey. As I worked professionally in the mental health and public school settings as a recreational therapist, teacher and challenge course facilitator I became even more interested in the philosophy of experiential education. I pursued a graduate degree in the field. At that point studying the work of John Dewey and others in addition to Taoism enriched my work as a practitioner. I am especially excited now about the new research on the brain and learning and how that information validates some of these ideas about experiential education first put forward so many years ago. FNF: What is your favorite activity as a facilitator? JS: I really think beginnings and endings are very important. I like to have a great activity to start off a group from the moment people enter the room and then an activity at the end of a program to “tie it all together”. Oftentimes I use the same activity for both purposes. To start a group I place an assortment of objects, or postcards, quotes, or pin-back buttons for people to choose from as they enter the room. Depending on the goals of the program, I might ask group members to choose a postcard that represents their goal, or an object (from my mini-metaphors, or a my toolbox collection) that represents a strength they bring to the group. The pin-back buttons and quotes are great for starting this kind of reflective conversation. At the end of a program it can be interesting to come back to the introductory activity to see how the group has progressed or how individual perspectives or goals have changed. Often people find it easier to share when they can attach their thoughts to an object or image. The reflection can become more metaphorically rich than with conversation alone. This method is “participant centered” by putting more control upon the learner for interpreting their experience, feelings, or goals rather than the leader directing and possibly inserting their own interpretation or agenda. This opens up a spontaneity of experience and possibly a deeper connection to the experience and relation to real life. Recent research on the brain and learning suggests that when people can attach thoughts or key concepts to a metaphoric image they may retain it longer. FNF: Describe one of your favorite ways to lead a discussion or debrief an activity. JS: After the group has completed a lesson or problem-solving task, I place a whole set of the postcards, charms or a number of objects out in front of the group. I then ask them to choose one postcard or one object together that best represents what they achieved as a group. Sometimes halfway through a program I will ask them to come to agreement on three cards or objects that represent where they started as a group, where they have gone so far, and where they hope to go next. This method builds consensus. Participants are drawn into the task of choosing and are often unaware they are processing. Often group members share profound insights about the group experience as they discuss their choices to the group. FNF: How does an experiential approach to education fit in with public schools where the emphasis has become more and more on achieving standardized test scores? JS: An experiential approach teaches what many are calling “21st Century Skills” such as critical thinking, problem solving, and communication. FNF: Why do you think so many people are quick to rely upon a lecture or PowerPoint format for their teaching or training? What advice do you have for someone who is hesitant to use experiential techniques in their teaching or training? JS: Often facilitators are afraid of losing control of a group. They feel they need to be the “expert”. They have difficulty trusting the group process and worry that they might not meet program goals. I encourage facilitators to empower their group, to take a step back, allowing the group members to step forward and take more responsibility for their learning. I encourage hesitant educators to experiment and try just a few techniques at a time. Typically they are amazed at what happens within a group when they take a step back from their more directive approach and implement more experiential methods. A good leader inspires others with confidence; a great leader inspires them with confidence in themselves. FNF: If you had to go to a desert island for your next training event, what three essential supplies would you take with you? JS: As much as I love "stuff" like vintage items in my toolbox, my postcards, or charms, I think being able to "make do" with what you have can bring opportunity in itself. Lately I have really been enjoying activities that involve very few props such partner handshakes or concentric circles. So, I would try to rely on what was there. There must be some interesting “stuff” washed up on the shore of a desert island! Learn more about Jen Stanchfield and sign up for her blog at Experiential Tools . Each of us has so many facets to our person-hood that may not be revealed even between those who have known each other for years. Discovering these different dimensions can help keep long-term relationships healthy, interesting, and fun. Here's an activity that's especially good to do with someone you know well—or think you know well! d) The one that you think least fits your partner. Spend a few minutes explaining your choices one pin at a time. Were you surprised by any of your partner's choices for a) or b)? How do you feel about your partner's choices for c) and d)? Next, what does your combined choice of buttons say about your relationship? Do you feel you know each other well or are there ways the two of you are like ships passing in the night? What would you like to do more of in your relationship? Last, agree upon one button to represent your relationship. If you don't have a bag of Conversation Starter buttons, get creative! Crack open some Chinese fortune cookies or page through the comics of the Sunday paper and choose a character to fit your partner's personality. If you try this activity with a colleague, friend, child, or partner, please let me know the result (email Brian)! Did you miss out last year? Here's your chance to attend Thiagi's Interactive Techniques for Instructor-Led Training Workshop. Attend the fourth day and become a certified Thiagi trainer. This event sold out last year. If you register by January 15th, you save $370 for the 3-day workshop and $125 for the 1-day certification program. Planning on staying at the hotel? We have blocked off a limited number of rooms at a discounted rate of $99. Mention “The Thiagi Group” to get the best price when booking your room, or ask for our sales coordinator, Julia Wolkin. She will take good care of you. Phone: 214-622-1013, Email: Julia.Wolkin@marriott.com . The 1-day certification workshop (that licenses you to conduct this workshop) will be held on March 31, 2011 at the same location. If you register now, you save $370 for the 3-day workshop and $125 for the 1-day certification program. Here are some additional details about these workshops. You can also download a detailed brochure (194k PDF). Groups of three or more who enroll at the same time will get a 15 percent reduction on their registration fees. Van den Bergh Thiagi Associates are happy to offer their tenth annual workshops in Winterthur, Switzerland (near Zurich). This workshop is designed for trainers, instructional designers, facilitators, managers, and performance consultants. The workshop helps a wide range of practitioners, from newcomers to experienced specialists, to master skills and concepts related to different types of training games, simulations, and learning exercises. This workshop practices what it preaches. Participants learn new principles and procedures and apply them to creating and conducting different types of learning activities that meet their training objectives, audiences, and needs. This workshop is designed for participants who have completed Thiagi's 3-day Interactive Training Strategies workshops. A design clinic in which Thiagi and Sam will provide consultative advice and feedback on interactive training activities that you are currently designing (or planning to design). Peer review and support that uses structured strategies to encourage you to present your ideas, plans, and problems to your fellow participants and receive valuable feedback and guidance. Advanced sessions on interactive strategies and facilitation techniques. Selected topics will include facilitating multinational and multicultural groups, online games, interactive webinars, positive psychology activities, and intrinsic motivation. Bonus: The workshop will provide you with a software package for designing online games and train you how to use it. If you have ever attended one of Thiagi's workshops or training sessions, you would likely describe Thiagi as a funny guy. He probably shared one of his many personal anecdotes, jokes, or tricks, and he had you laughing in no time. There's a lot of research that shows that humor plays a positive role in training. Some research suggests that humor improves the classroom climate, and in the process increases learning retention, reduces stress, and makes learning more enjoyable. However, others question the research, and they suggest that humor can actually be a form of harassment. They point out that what one person finds amusing another may find offensive, and this negativity can deteriorate the classroom climate as participants feel increasingly uncomfortable, competitive, and stressed. Do you like to use humor in your training? What guidelines, tips, and recommendations do you have for using or not using humor in training? Feel free to include your opinions, anecdotes, guidelines, suggestions, or anything else on your mind. Maxine: I believe the research reports that claim humor increases creativity and learning. I like to use multiple sources of humor like magic, storytelling, cartoons, dress-up days, improv., and more. There are 101 ways to have a happier, healthier, and more creative session. Vern: This may be politically incorrect to say, but I think gender influences the impact and use of humor. For example, in a training session with a mixed group of men and women, I have found that the men are more likely to enjoy humor. Women seem more concerned about being taken seriously than participating in a joke. Brian: I collect hundreds of cartoon strips and bring them to my sessions. I then have the participants sift through all of them and choose one to create a metaphor that relates to the topic. The participants love it and it is a fun and effective way to include humor in training. David: I think you have to consider the situation and the topic when deciding the level and the type of humor to use. There are professions like doctors and pilots where a certain level of seriousness is tied to their credibility. An overuse of humor in these situations can be detrimental. We also asked you what you thought were the top influences in the training industry in 2010. Here's what some of you had to say. Response 1) I think that in 2010, learning has become more self-directed than ever before and training continues to move towards an informal direction. This is in part due to the proliferation of blogs, webinars, podcasts, and e-learning. Response 10) Our company continues to stress less waste, and the push to be more green. Response 12) You mention a slow and steady increase in national training budgets. I am not seeing it at my company. We are still in the slashing mode. See more readers' responses or add your own. My friend Curt Bonk (who dresses like Indiana Jones and writes like Thomas Friedman) has designed and produced a series of 27 brief (7-10 minute) videos related to teaching online. This highly popular video (or video podcast) series, Video Primers in an Online Repository for e-Teaching and Learning (V-PORTAL), covers topics for both novice and expert online instructors and educators. Watch them and learn how to engage learners with Web 2.0 technologies, build instructor presence, prepare highly interactive and relevant online activities, access free and open course resources, plan for the future of e-learning, and much more. You can have rapid access to these videos through Curt's YouTube Channel ( http://www.youtube.com/user/TravelinEdMan ) . If you want to watch the videos and find linked resources, use Indiana University's School of Education Instructional Consulting Office web site ( http://www.indiana.edu/~icy/media/de_series.html ). Whether you are interested in emerging technologies or innovative pedagogies, this video primer series is for you. What's more, you can watch them on the Web for free from anywhere in the world. You can view them while sitting at home in your pajamas and fuzzy slippers while sipping some hot chocolate, eating lunch at your office desk, or relaxing at a mountain or lakeside retreat. Each lesson is delivered to you in 10 minutes or less. You might give certificates out to employees who watch and reflect on how they might use ideas found in each one of them. Alternatively, you can ask Curt Bonk, the host and developer of all 27 shows, to give you and your staff a personal overview of any of these topics. Such a session—live or online—might last just 15 or 30 minutes or expand into a 1-, 2-, or 3-day workshop. In any case, your instructors, instructional designers, and administrators will be much better prepared for the highly interesting and complex world of online teaching and learning. Enjoy these free video primers in the V-PORTAL! Instructor training: Present videos to online instructors for reflection. Workshops: Embed the 27 video primers in a brief or extended workshop. Certification: Design activities related to the videos as part of a training program. Student courses: Use videos as supplements to course readings related to new or emerging technologies, online teaching and learning, and blended learning. Personal exploration: Dig into an area of interest. Discussion: Present a video for 10 minutes followed by 5-10 minutes or more of discussion or reflection activities. Debates: Use these videos to jump-start debates on new courses, programs, or initiatives. Strategic planning: Use these videos to highlight potential areas related to online learning for a department, program, school, university, corporation, or organization. Retreats: Use the contents of the V-PORTAL in faculty or administrator retreats. Accomplishments: Use the ideas in these videos to identify areas of strength (as well as weaknesses) or areas in need of further development. Curt gives you permission to link to these videos, share information about these contents with others, or translate the contents to another language, as long as the contents (i.e., the videos) included here are used for non-profit educational purposes. As a courtesy to the Indiana University School of Education and Dr. Curt Bonk, the host of the 27 video primers, please send an e-mail to Professor Bonk ( cjbonk@indiana.edu ) to let him know how you are using these learning resources (i.e., the intended purpose) as well as who is using them. Thank you.